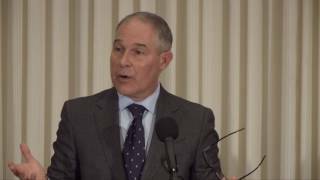 On February 17, 2017, the United States Senate confirmed Scott Pruitt as the 14th Administrator of the U.S. Environmental Protection Agency. As Administrator, Mr. Pruitt’s overarching goal is to lead EPA in a way that our future generations inherit a better and healthier environment as he works with the thousands of dedicated public servants at EPA who have devoted their careers to helping realize this shared vision, while faithfully administering environmental laws. Most recently, Pruitt served as the Attorney General for Oklahoma. Almost immediately upon taking office, he worked with his Democratic counterpart in Arkansas to reach agreement to study the water quality of the Illinois River, which crosses the border between the two states and has been enjoyed by generations of Oklahomans. The Statement of Joint Principles provides for a best science study using EPA-approved methods, with both states agreeing, for the first time, to be bound by the outcome. 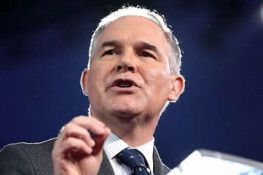 Also during his tenure as Oklahoma’s Attorney General, Pruitt led an historic water rights settlement between Oklahoma, Oklahoma City and the Choctaw and Chickasaw Tribal Nations that preserved the ecosystems of scenic lakes and rivers on native lands. The agreement, which required Congressional approval, was enacted into Section 3608 of Public Law 114-322 and signed in December 2016. It provides a framework that fosters intergovernmental collaboration on significant water resource concerns with the settlement area, while at the same time protecting existing water rights and affirming the state’s role in water rights permitting and administration. Water settlement cases can be lengthy, costly, divisive and disruptive; however under Pruitt’s forward-thinking leadership, the process was hailed by all parties as one of commitment, hard work, perseverance and cooperation. Pruitt became a national leader through a career of advocating to keep power in the hands of hard-working Americans. He has a proven track record of working with others – including industry, farmers, ranchers, landowners and small business owners - who want to do the right thing by the environment. He has dedicated his career to creating policy that serves the people. 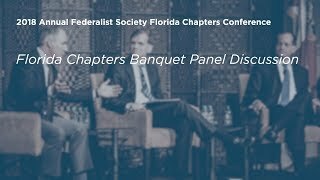 He strongly believes that environmental law, policy and progress are all based on cooperation between the states, cooperation between the states and EPA, and cooperation between regulators and the public. As Attorney General for Oklahoma, he led the state’s legal challenges against property rights intrusion, while protecting Oklahoma’s natural resources and environment. He is recognized as a national leader in the cause to restore the proper balance between the states and federal government, and he established Oklahoma’s first federalism unit to combat unwarranted regulation and overreach by the federal government. Before being elected attorney general, he served eight years in the Oklahoma State Senate where he was a leading voice for fiscal responsibility. 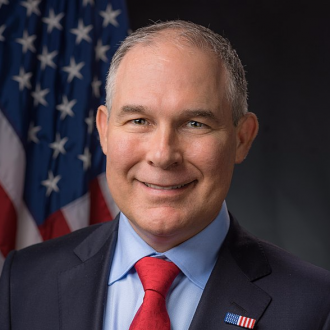 After earning his Bachelor’s Degree from Georgetown College and graduating from the University of Tulsa College of Law, Pruitt went into private legal practice, specializing in constitutional law. In addition to his life as a civil servant, Pruitt is a successful entrepreneur. As a co-owner and managing general partner of Oklahoma City’s Triple-A minor league baseball affiliate, the Oklahoma City Redhawks, Mr. Pruitt took over the team’s marketing operations and helped the team become one of the minor league leaders in attendance and merchandise sales. Pruitt is, first and foremost, a family man. He and Marlyn, his wife of 27 years, proudly raised their daughter, McKenna, and son, Cade, in Tulsa. Pruitt has made it a priority to pass on to his children the same principled family values with which he was raised. Governmental Power versus Free Speech?